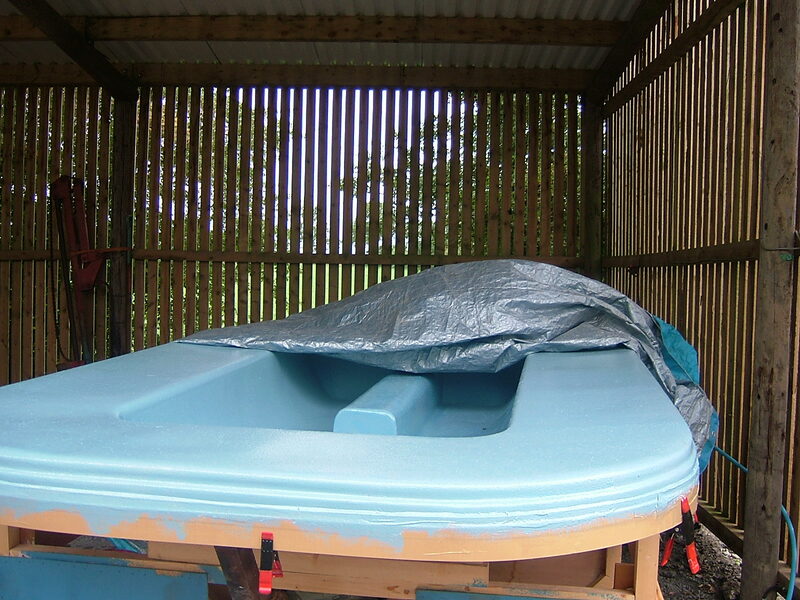 By now I had a new mould for a top deck/hull and a polished mould for a planing surface that I thought would give me one piece from which I could take another mould. But, we’re getting a little ahead of ourselves here. I mentioned in the introduction to the Outlaws that I had formed a plan. the plan was to build a new craft on a light, interesting hull. It also involved twin ducts because I like twin ducts and a four stroke engine because I like four stroke engines. I’d still go shaft drive because otherwise engine choice is a bit limited. 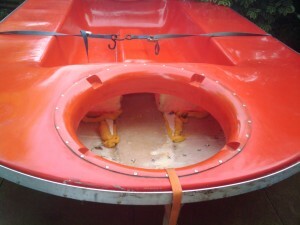 We’ve seen how the top deck plug was mounted, buffed and a mould taken. The next step was to take a part from that mould. For reasons unknown I don’t have any pictures of the new mould. Suffice it to say that the plug was pulled of the frame and the mould put onto it. Now I have a mould on a nice frame that can be rocked over at a jaunty angle to make laying up easier. First up, after waxing and polishing comes a couple of layers of gelcoat. I chose a letterbox red. Then a mix of CSM and Diolen. I think I put down one layer of CSM followed by Diolen followed be CSM. It’s been a while, cut me some slack. The plan was to use two fans, one for thrust, another for lift. 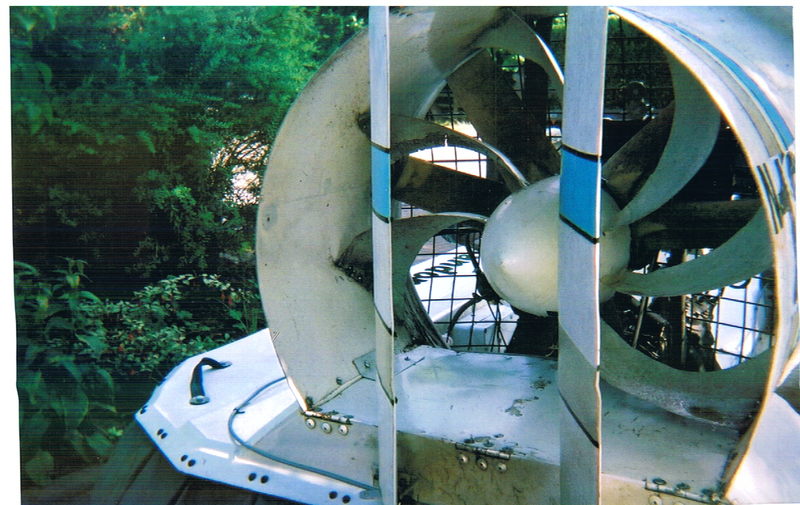 The list fan duct is made from GRP as to be expected and was given to me by a freind who has moulds for this kind of thing and a spare duct. 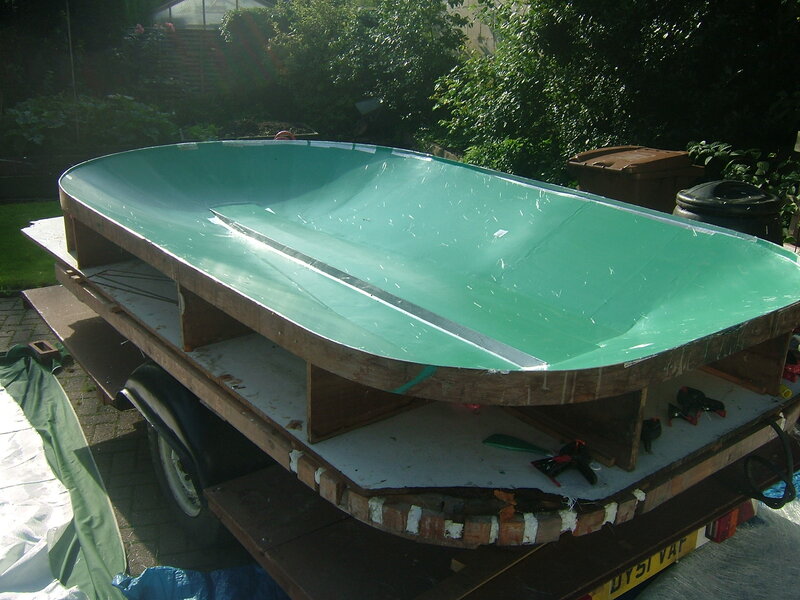 It was quite a simple matter of finding the centre of the front section of the hull, cutting a big hole and using glue and rivets to hold it in place. 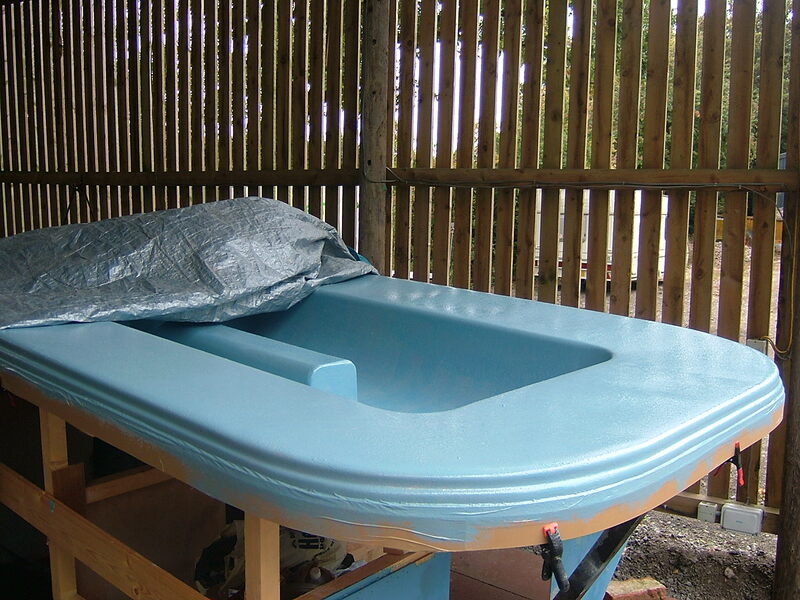 Making a new top mould. Next the matting goes on. If I remember correctly 6 layers of CSM but the job is so boring I may have mis-remembered. The mould for the planing surface. The mould for the planing surface was made from a plywood frame with a hardboard surface and was in a very sorry state. After several attempts at restoring it I decided to make it good enough to get one part out of it and make a new mould from that. The mould above has been filled with pounds of car body filler, painted and waxed. I decided that I had gone about as far as I could go with the Motocyclone and although I was somewhat sad to see it go, I had to move it on to someone else and build new one. I tried starting the new craft while I still had V2 but it really wasn’t a good idea. What I had done however was form a plan. First of all I wanted a new, light hull. 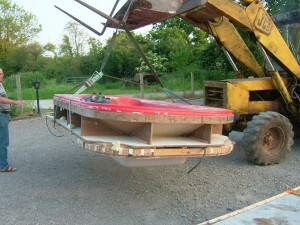 Weight is very important in hovercrafting and V2 had become too heavy. I was unsure which hull too choose but “cheap” was important and “interesting” was important too. I rather liked the look of that and after some chatting I found the Geoff Sweetman was instrumental in its design and build. At the time I wasn’t on the lookout for a new craft but now I was. It turned out that Geoff had the moulds and was looking to sell so I set off down to Kent in August 2008 with a borrowed trailer, some cash and a slice of optimism. What you can see in the picture above is my old friend Jake getting the bits off the trailer. 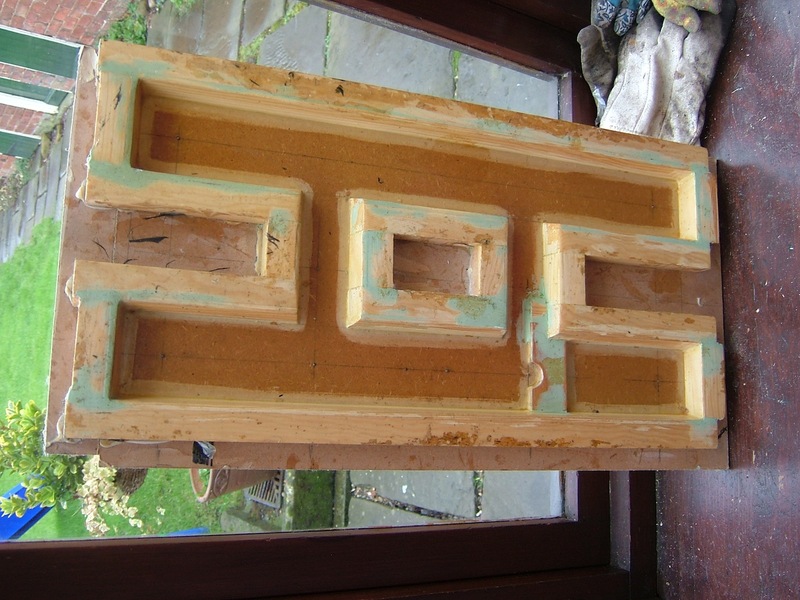 What I actually got was a two-sided wooden mould and a GRP plug that had originally been taken from the mould and had then been modified to have a centre console. 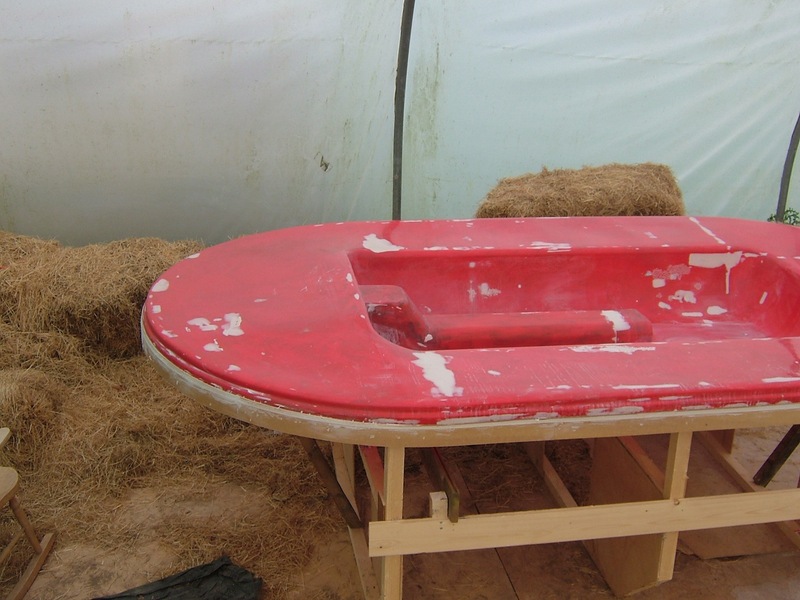 You can see the hull side of the mould is hanging down but that won’t be used again so it doesn’t matter. The top side is the planing surface mould and the plug is resting in it. 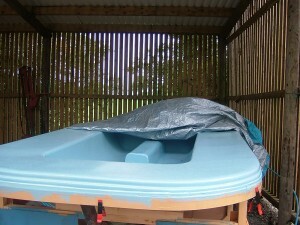 The first step was to be the refurbishment of the moulds and the start of the Outlaw dynasty. I had a lot of fun with Random Orbit mk2 but I decided I wanted to move on and that I couldn’t get it to go much faster so I sold it on. The last time I saw it the old thing was still going strong. The majority of the hull is about twenty years old by now and it’s not getting any lighter but it still gives me a wee twinge of pride when I see it. In 2008 it was driven be David Northall in the HCGB national championship. It was sold on to race again but I’ve lost touch with it now. Keep your eyes on ebay. One of my overriding design ideas for Version 2 was that the duct should be clear of obstructions and that the engine was to be as low as possible and out of the way. To achieve this I decided to put it down in the corner of the craft. In order to get it to fit and too make use of standard length drive belts that didn’t give me much height and so the engine frame couldn’t be the usual chunky steel affair. Because of this and also because I fancied having a go at it I made the engine frame out of carbon fibre. As you will see, I didn’t think to take a photo (despite it being a thing of beauty), but I did take one of the mould I made it in. Firstly an apology. For some reason I didn’t take nearly enough photos of this… Sorry. In most cases, when you fit a lift duct to a craft that didn’t have one, you cut a large hole in the front deck and fix in a glassfibre duct. The Moto cyclone doesn’t really have a front deck to speak of so that’s not an option. You can see from the pictures of Random V1 that there was a black fly screen at the front. This was fixed to raised lip that runs all around the cockpit. The new duct is a large moulding that fits over this lip and about a third of the length of the craft. The inside wall of the cockpit was removed as was the buoyancy up to about half way down the plenum. The new duct was fitted and because I needed the buoyancy and didn’t need a very wide cockpit, a large chuck of the foam was glassed in on each side of the cockpit. 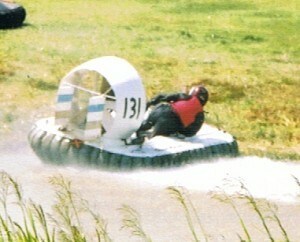 At the back a 900mm duct was fitted in place of the 750mm. This tme there was no need for a splitter plate. The flow straigteners are standard this time and were bought from K&M products as was the duct. A centre console was needed. The old one wasn’t long enough as there was going to be a prop shaft running the length of the craft and it’s not a good idea to crouch down over an un-guarded prop shaft that’ rotating at 3,500 RPM. A new console was built. This was made from GRP layed up on to a foam plug which was then removed. It wasn’t pretty but it was functional. Other guards were built from steel and aluminium to cover other exposeded bits. More on that later. It started with an innocent enough conversation along the lines of “You know Andy, most people with a TZR have a bigger duct”… “Do they? (quick look round) Oh yes.”. Out with the angle grinder. Random Orbit version 1 had a 750mm duct and putting 45bhp through that is a bit of a tall order and so I decided to put a bigger duct on. I’d also heard that some time earlier, someone had put a lift duct on a Cyclone and raced it in F1. I decided I’d have a go at putting a 900mm thrust fan and a lift fan on Random Orbit. The rules in F3 say that you can run any number of two-stroke engines in any combination up to a maximuim of 250cc but it’s tricky finding a good combination to give lift and thrust so I decided to try a shaft drive. A shaft drive means you can get the advantages of twin ducts on a single engined craft but designing one does make things interesting. A big note… I didn’t take nearly enough photos and without them it all seems a bit dry so this section is very short. At the front end, the steering starts with a pair of handlebars and a piece of 25mm steel tube. This runs down through a bronze bush fixed to a plate. a nut has been welded at the bottom of the tube and a bolt fitted through the hull. The tube is simply screwed on the the bolt so the bars can swivel round on the bolt. I used a ‘U’ bolt to clamp a flat piece of bar to the top of the tube and fitted the end of the morse cable to that. The movement of steering is restricted by two bolts mounted in the centre console so I can’t put too much weight on the morse cable. At the back, the morse cable ends a right angle bracket. 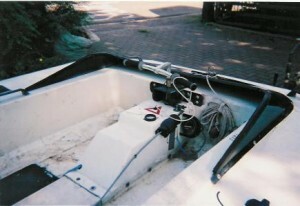 the center of the cable connects to the right hand rudder which is in turn connected to the left by a piece of aluminium tube and couple of rod ends. I have a pair of rudders made of glass fibre on a foam and balsa core. I decided to experiment with vacuum bagging to see if I could make a glassfibre rudder without making two haves and joining them together. With this technique, I made two end pieces from “T” section aluminium, fitted captive nuts to use as mounts. I sandwiched one at each end of two pieces of foam with a piece of balsa down the centre (just to give it some strength whilst I was making it). The next job was to carve the shape. As the foam is very soft, it was a simple matter to sand it down. I then layed up some glassfibre matting with resin, wrapped it around the foam, covered the lot in pin-pricked halar release film. Next came a layer of peel ply followed by bleed cloth and the lot went into a plastic bag. Using a compressor from an old freezer, I sucked th air out which pulled the material and resin upto the foam. After a few hours, when the resin has cured, open the bag and trim the trailing edge. The fan frame is a classic ‘H’ shape made from 25mm square section steel tube. The horizontal is much larger section recangle and is drilled to take the 25mm spindle that the fan hub spins on. 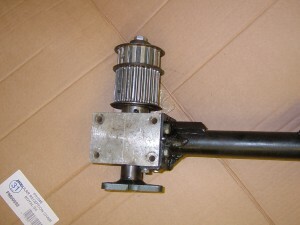 This spindle has been welded into place. The frame is fixed to the front of the duct at four points and it is also fixed to the floor. Engine frame side view When I started building this frame, I was given a very sensible piece of advice which was to make sure that the fan frame can be removed from the craft without having to go underneath. This makes it much easier to get the frame out if it requires emergency repairs. With this point in mind, I fixed two pieces of angle iron to the floor and then bolted the fan frame to those so that it was easier to remove the frame. Engine frame front viewThe engine is mounted in a cradle-like sub-frame that hangs the engine from its original mounts. It also carries the plumber block bearings. This frame is bolted to the fan frame at a pivot on the right. The left hand side is supported by two turn-buckles so that I can quickly raise or lower the drive pulley to tension or change the drive belt. The drive is taken from the crankshaft through a flexible coupling, a couple of plumber block bearings to an 18 tooth H200 pully on a taperlock bush. A 410H200 drive belt takes the drive upto a 54 tooth pulley at the top. This is bolted to a hub which in turn, carries the fan. I used 6 Multiwing 4Z blades in a 9 blade hub. Although this looks a little odd, it seems to work quite well. 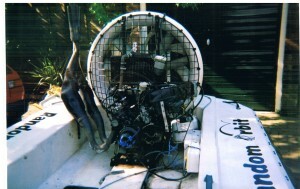 The engine is a Yamaha TZR unit from around 1988. This 2 stroke liquid cooled twin develops around 45HP and revs to 10500 without any trouble. 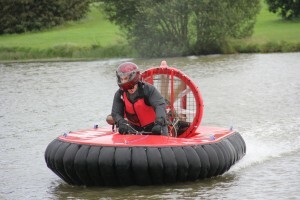 Converting to hovercraft use seems a little daunting but can be done in 2 stages if needed and is not so bad when you get down to it. The first stage involves removing the contents of the gearbox casing, but leaving all of the existing engine mounts. For the second, you cut the gearbox casing off and bolt mounting bars underneath. I went for option 1. The first thing to do is to strip down the engine totally and take out the gearbox internals. Now you need to take a drive for the fan and pully straight from the crank shaft. This saves weight and reduces losses but means loosing the oil pump and water pump both of which are driven from the gearbox. Living without the oil pump it not a problem as this is a 2 stroke and it’s only used to add oil to the fuel, which in turn oils the crank. 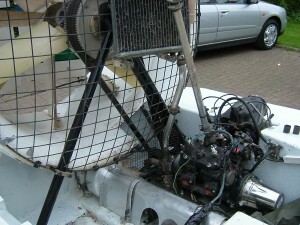 Just increasing the jets in the carb a little and adding oil to the fuel sorts that one out. The water pump is slightly more tricky. Several types have been tried in the past including pumps driven by the fan belt but most people have settled on an electric pump. The trick here is to find one that’s rated for around three gallons per minute and can stand nearly boiling water. Don’t be mean on the water pump of you’ll end up paying in engine rebuilds. Also, remember to get the direction of flow through the engine right. In through the bottom, out through the top. One thing to keep in mind is the problem of vibration. These engines are revving to around 10500 RPM and really do vibrate. If you bolted everything together and to the hull, something would break. So somewhere, there needs to be some rubber mounts. If you go for option one on the engine, as I did, you get the two original rubber engine mounts. With a flexible coupling on the drives shaft, the problem is solved. With option two, cutting off the gearbox casing and bolting mounting bars to the base of the engine, most people bolt this down to the fan/engine frame and then rubber mount that to the hull.